Lara Reznik, a native New Yorker, escaped to New Mexico in the 1970s in a Karmann Ghia that she jump-started cross-country. She later married Rudy Chavez whose family ranched the bosque for over 300 years. Their 30+ year successful marriage is the basis for exploring Bagels and Salsa's theme of celebrating cultural differences. This multi-cultural love story is laced with humor, drama, and suspense, beginning when Laila Levin falls on a stage in New York City and is rescued by Dr. Eduardo Quintana. This scene is humorously touching without being slapstick simply because of Ms. Reznik’s mastery of her craft. 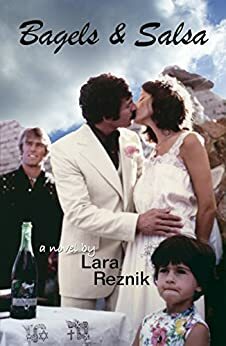 From here, we are introduced to a variety of multifaceted characters (Laila’s Jewish mother is fabulous) as Laila and Eduardo fall in love, and she returns with him to his family ranch in rural New Mexico. Then there’s Violet, Eduardo’s ex girlfriend, who left him to pursue a career in Hollywood; failing that, she has returned with plans to win him back. The interesting characters are too many to introduce here, but notable are Violet’s aggressive mother (mothers are powerhouses in this book) who conspires with Eduardo’s mother, her best friend, to get her daughter and Eduardo back together. The cultural clash is riveting as this nice, protected Jewish girl from New York suddenly finds herself in a milieu of rowdy, rodeo-riding, beer-guzzling, whooping-it-up cowboy cousins—not to mention the anxiety she suffers when a Son of Sam copycat develops a fixation on her. A satisfying, well-written story. Highly recommended. A stand alone read with a HEA. I really, really enjoyed this story. it is really so different from any romance I have read in the past. it is set in New York in 1977. Then it moves on to New Mexico. The heroine's family is Jewish and the hero is Mexican. I have no knowledge of either of these two cultures so i am going to assume the author does have a lot of knowledge. We have all heard about the "Jewish mother" and the one in this story fits what we have always heard about a controlling parent. Apparently in the Mexican culture it is the same. The mother seems to rule the family and everyone does as she dictates. The hero has been in New York getting his medical doctor's license with the intention of returning to his small home town and setting up a practice there. The heroine has her degree as well as her Ph.D. and she is working on a government grant studying the problem of teenage pregnancy in the United States. They meet quite by chance and he is instantly drawn to her. They are so different but yet they have such strong feelings for each other right from the very first. This story has a bit of mystery, romance, a lot of comedy, and the study of two different cultures. We also get to travel to New Mexico to see how the people live in a very small town outside of Santa Fe. I really had no idea. It is such a good story as these two try to keep to their own culture but be accepting of the other's beliefs. One moment that gave me chills and brought tears to my eyes was outside the hospital when she saw his father riding his favorite pony, holding a baby and a cat in his lap. Oh my..what a moment. This story covers a lot of family issues. It was also sort of fun to read about a period that has been in the recent past. There were things referred to that were big during that time but seem so old now. No cell phones! That was fun. The only phone was the land line. Something that almost doesn't exist any more. Sort of like the good old days. It is a very good read, very different from most of the modern day romances that I have read lately. It is very entertaining and I definitely recommend it. I learned a lot. I think it took her personality to make things work the way she did. She had a great sense of humor and you really want things to work out for her. A very good read. I was not paid for this review. I am not a writer nor do I know one. I am not kin to this author. I am a reader and this is my opinion, nothing more, nothing less. 3/7/18. The story is initially set in New York City during the summer when the Son of Sam ran loose. Laila Levin, a Jewish sociologist, is speaking at a tough Bronx high school about her research on teen pregnancy when she meets the dashing Dr. Eduardo Quintana who is finishing up his residency in New York and planning to return and open a practice in the remote ranching community in New Mexico where he grew up. The two have an affair and fall in love and in a matter of weeks Laila follows Eduardo out west where she is greeted by his hostile mother, his stunning high school girlfriend, his biker and cowboy cousins, and alien events like a pig roast. It's a fun journey of cultural clashes with a satisfying ending that includes a big surprise. Bagels and Salsa, the latest book from Lara Reznik, continues the story of Laila from The Girl From Long Guyland. In this volume, Laila finds the love of her life---or does she? By switching the scenes from New York to New Mexico, Reznik is able to contrast not only the different natural landscapes of each, but alsoByhe differences (and similarities) between her New York Jewish background and Eduardo’s Latino culture. Setting the tale in the “Summer of Sam” adds an element of the thriller, and as usual her dialogue shows deep understanding of human relationships. I thoroughly enjoyed Bagels and Salsa! This book was a really fun read although not the typical book I would pick up. I was initially attracted to it because I had really enjoyed Reznik's first novel, The Girl From Long Guyland. At first I thought the story was just a romance, but as I read on there were many subplots that were both humorous and suspenseful. I especially liked the reactions of New York protagonist, Laila Levin after finding herself in an alien world of cowboys, quilting bees, and gang bangers in rural New Mexico. Towards the end, the unexpected twists and turns kept me reading late into the night. The ending did not disappoint without tying things up with a big bow. I recommend this book if you're looking for a lighthearted read with multicultural and multidimensional characters and an engaging plot.